Home Unlabelled Every Woman Should Know These Tricks. Here Is Why! Every Woman Should Know These Tricks. Here Is Why! Can you count the number of bras that you had to throw away before they are properly “worn – out”. One of the most annoying problems with any conventional bra are the wires that come out and cause discomfort and even bruises. You can’t wear those without wires, they don’t have the same support. You may have tried different thing, but have you tried this trick? All you need is a sanitary towel. Cut it into smaller sections and apply them over the end of the wire. This will keep the bra underwire from poking out. You can also try putting a bit of a heavy fabric like denim over the ends and glue it in place with a glue gun or washer safe glue. However, cotton is way more comfortable. Cover and Protect Wounds – Sanitary pads are an excellent way to stop bleeding in case you don’t have have a band-aid around. Simply cut a piece as large as you need and apply it on the cut/wound by pressing lightly. 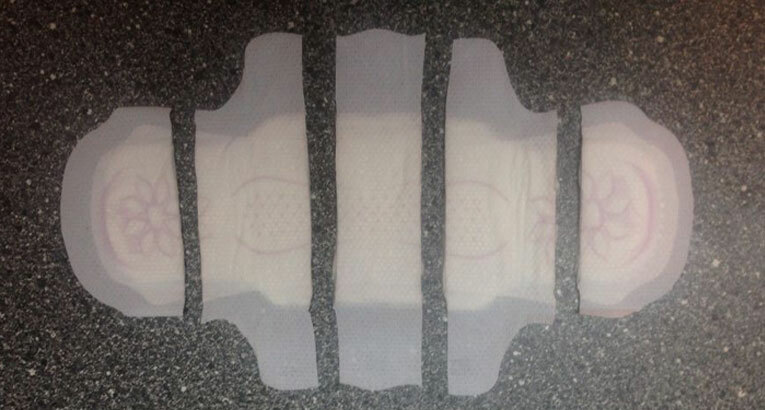 The sanitary pad is completely safe to use because of its sanitary packing. In addition, you can put medicated ointment on its surface which will not only prevent contamination but will also speed up the healing process. It can be used as breast pad – If you are breastfeeding, these pads can be great for you. Sometimes it happens, the milk will uncontrollably come out of your breast so, in this case if you do not have special pads for this cause, the ordinary ones will serve great. Control your sweating – use the pads as a comfortable, disposable, and deodorizing shoe pads. Place them inside before wearing shoes so that you can get rid of bad odor and sweaty feet. Moreover, use the pads as an instant armpit sweat protector. Stick them inside the shirt armpits and when they are completely soaked, replace them with new ones. Do this trick if when you ae wearing your formal attire gets you sweaty. The sanitary pads can be used as headbands for moping the sweat so it won’t run into the eyes. They can be used for growing sprouts – Pads have great capacity for retaining moisture so you can take advantage and use it for beans. Dip the pad in water, place it in a glass jar that lies on flat. Then, apply the seeds that you want to raise. Place the jar near the window and after a while you will notice how your seed sprout. Clean up wet messes – the pads work as an indestructible paper towel, working great as small-sized disposable cleanup pad. This would be even better if you find napkins which contain baking soda in them. If you have a dirty microwave, soak a sanitary napkin in water and nuke the wet pad for 1 minute. This will steam up the inside of the microwave and softening whatever is stuck inside the walls. Use the same pad to wipe it off when you are done. Use the napkins to soak up melted ice cream and remove any gooey mess in the fridge. The pads that contain baking soda will be perfect for deodorizing the fridge after cleanup. Open it and put the pad in. all the odors will be absorbed automatically. The sticky side can even be used to stick it on the wall. Shoe Pads – An easy way to get rid of sweaty feet and bad odors is to put a pad inside your shoe before putting it on.